COMMUNITY: The heart of the Craggin’ Classic is a grassroots celebration of the climbing community. Through films, campfires, slideshows, music, local food vendors, and beers, the series brings climbers together—both seasoned and new—to celebrate and inspire one another. COMPETENCY: Climbing clinics, driven by professional athletes and local guides, help event participants build their skills, gain confidence, and enhance their game. And everyone has something to learn. Clinic topics cover a range of interests and experience levels such as Intro to Big Wall Climbing, Learn to Fall, Self-Rescue Techniques, Multipitch Management, Bolting 101, Redpoint Strategies and many more. 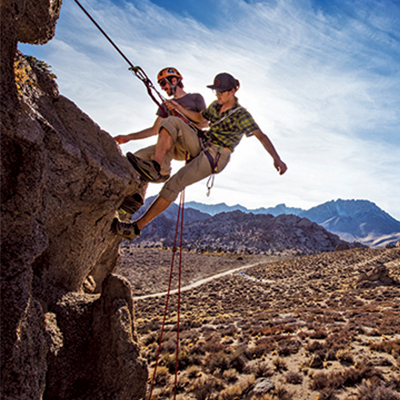 CONSERVATION: Stewardship of our climbing landscapes requires, first and foremost, a sense of ownership and responsibility by the climbing community. The Craggin’ Classics work to instill these values within event participants through hands-on crag conservation projects. Additionally, climbers develop and retain good working relationships local land management agencies—relationships crucial to maintain future climbing access.